I think I’ve been pigeon-holing myself a bit with the retro-comics I’ve been writing about over the past few months: the original Hobgoblin Saga review over the summer and last month’s Avengers/X-Men 50th anniversary posts. So with that in mind, I’m not going to “officially” declare October, “Venom Month.” Instead, because Marvel’s Venom series is ending at issue #42 in a few weeks and a Venom/Spider-Man crossover is expected to take place in the pages of Superior Spider-Man in November/December, I thought I would periodically spotlight some of my favorite Venom stories. In other words, you’re all probably going to get a steady diet of Venom-centric posts over the next month or two. Just don’t call it a “theme month” and everything will be okay. There’s no better place to start a non-theme month than with Amazing Spider-Man #315, the first of a three-part storyline during the David Michelinie/Todd McFarlane era (or is it the McFarlane/Michelinie era?). This arc marks the second full appearance of Venom since he first set the world on fire in Amazing Spider-Man #300 (my sentimental favorite comic from my childhood). I personally think these three issues are essential reading for Symbiote fans since they do such a fantastic job defining Eddie Brock/Venom’s character – his ambiguous moral code, psychosis and menace. Not that these traits aren’t explored in ASM #300, but with that issue’s exposition and origin story now in the rear view window, Michelinie and McFarlane use this storyline to cement Venom’s status as a true force to be reckoned with (and a fan favorite for years). What’s so gripping about ASM #315 is how it functions as a “calm before the storm” of sorts for Spider-Man and his supporting cast. 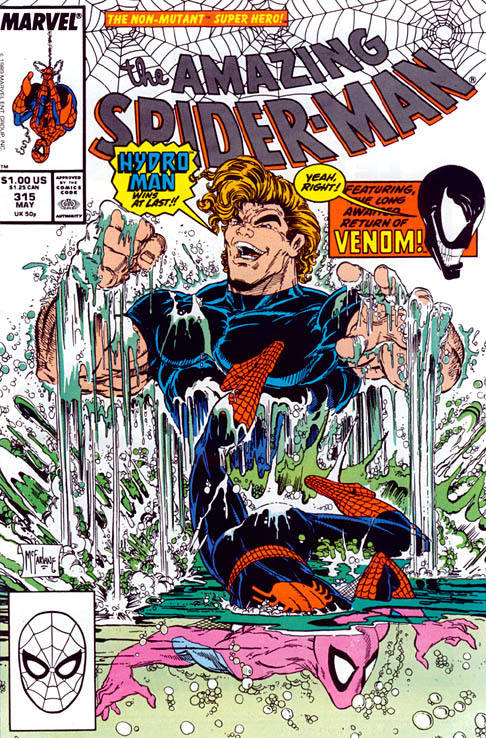 A Venom appearance is barely teased on the cover (with a Spider-Man/Hydro-Man encounter advertised as the “main event”) but the issue’s opening splash page shows Eddie Brock re-bonding to the symbiote and breaking out of the “Vault” super-prison in Colorado in violent fashion. 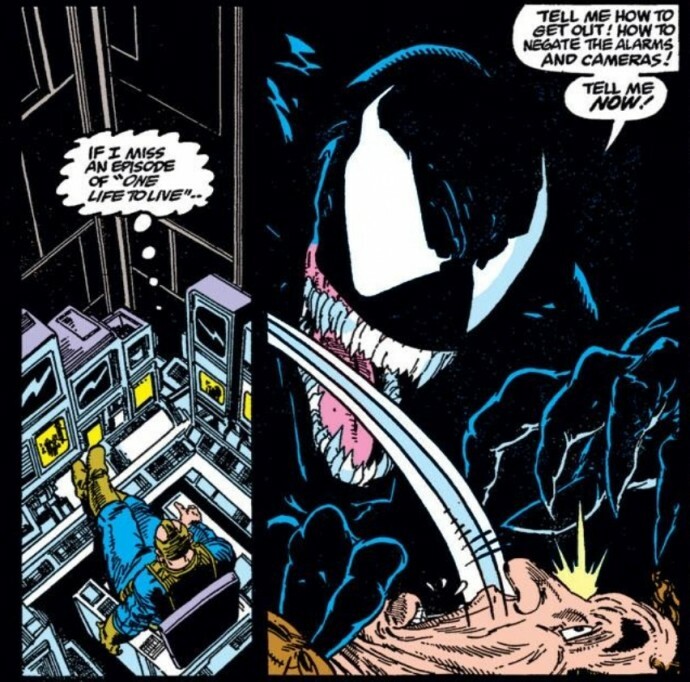 Venom is at his most disturbing during this sequence. He completely overwhelms the prison’s security guards, killing one in the process by smothering his face with the symbiote. But it’s what Brock does to the guard after he slays him that’s even more chilling. He bemoans the death of an “innocent” while kissing the dead man’s forehead like a mother would to a child with a fever. And just as the full-extent of Venom’s demented nature starts to grab hold of readers, Michelinie/McFarlane leave this story and go back to a much lower-stress Spider-Man/Hydro-Man confrontation followed with a “B” story about Aunt May’s sketchy geriatric boyfriend Nathan Lubensky. Nathan is once again in trouble for squelching on some gambling debts that he owes, so Peter does what he can to help Nathan and protect his naïve Aunt. 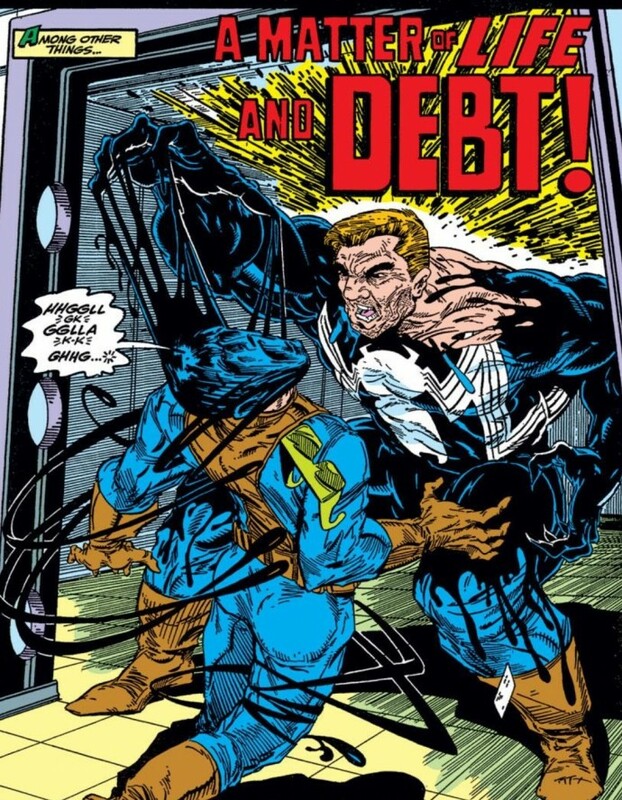 Little does Peter realize that while he’s dealing with petty thugs over the status of Nathan’s debts, a much more dangerous force is making his way to New York City intending to collect on a “debt” from Spider-Man since Brock believes Spidey ruined his life and changed him into the monster we know as Venom. It’s phenomenal story-telling from Michelinie/McFarlane because it’s one of those instances where the reader has infinitely more information about the hero’s peril than the hero himself, thereby adding to the drama of the issue. As we see Venom make his way across America, killing and/or torturing security guards, the tension is palatable. 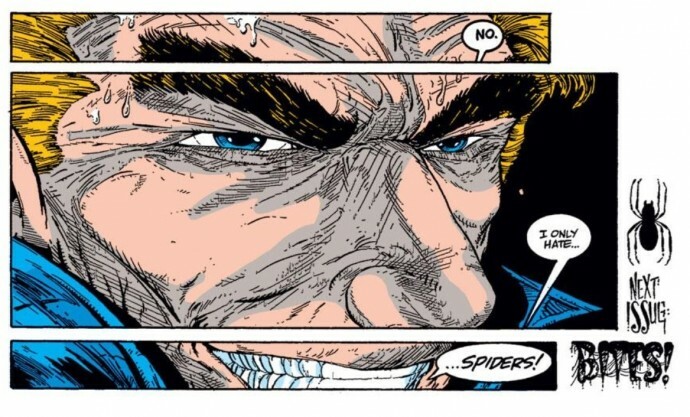 The comic’s final scene of Brock the hitch-hiker making small-talk with some average American family shows that a Spider-Man/Venom confrontation is inevitable. Spider-Man just doesn’t realize it yet. Additionally, the way Venom is treated in ASM #315, more as a looming, shadowy threat rather than an in-your-face monster, gives the comic a special “event” feel that’s befitting of the character’s second full appearance. 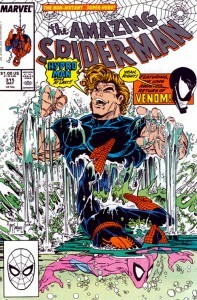 Venom, as a character, only got tired when Marvel beat him into the ground – tying him into every major Spider-man storyline while also making him the focal point of various mini-series during the mid-1990s. Keep in mind that in ASM #315, it’s been more than a calendar year since the character first debuted in ASM #300. When we last saw Venom, he had taken Spider-Man to the limit and the hero just barely emerged victorious. 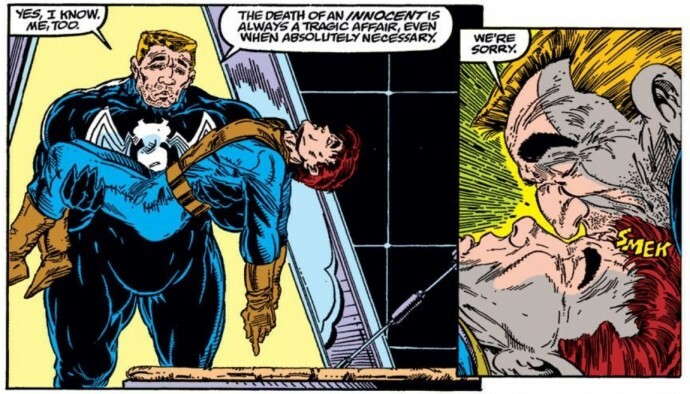 I’ve always felt that ASM 315’s measured re-introduction of the character demonstrated the faith Marvel ultimately had in him – that one or two scenes would leave readers wanting more rather than driving them away in frustration. It’s a shame that the powers that be at Marvel eventually lost that faith, or became too greedy to care, because it damaged Venom’s legacy. All the same, ASM #315 reminds me of what a big deal a Spider-Man/Venom confrontation used to be, and the fact that the next two issues would go on to deliver in spades, is a major reason why it’s so difficult for me to ever be too hyper-critical about this character. Because how can somebody dismiss a character or a story that more or less helped to hook them on the comic book medium as a child? This is part one of the “Return of Venom” arc. My thoughts on part two (ASM #316) runs next week.